April 24, 2018, Dubai: Michael Kors’ Ramadan capsule collection launch was an affair to remember. Guests were invited to the luxurious and elegant Penthouse, on the 16th floor of the newly opened FIVE hotel. Located on the Palm Jumeirah Dubai, offering picturesque views of the Arabian Gulf- the city’s key editors and influencers explored the brands’ latest offerings while taking in spectacular views of the Dubai Skyline. Media mingled, listened to the smooth tunes of regional DJ and stylestar Tala Samman, and explored a special curation of glamorous clothes and accessories. 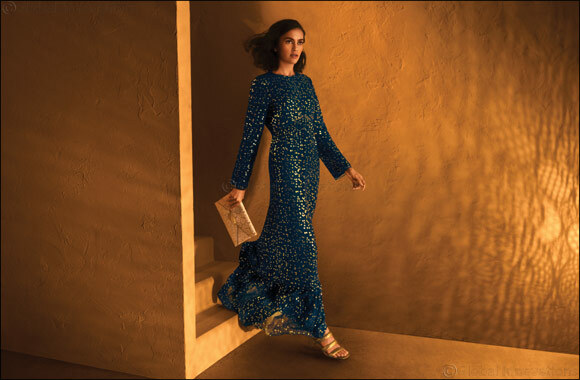 The capsule collection, which features a total of 19 MICHAEL Michael Kors pieces, includes 6 hand bag styles exclusive to the Middle East during the month of Ramadan and provides those who celebrate a little something extra to help them stand out during the special occasion! The Mercer Studio Bag on display is available in three luxe and exclusive colors—Admiral, Bright Red and Oat—the Mercer Studio bag is at once modern and sophisticated. The woven leather body is accented with smooth trim and top handles, while a removable lock charm delivers a signature touch. Complete with an adjustable shoulder strap, this versatile crossbody effortlessly transitions from daytime to after-hours. The Jade Clutch, another exclusive element of the capsule available in luxe Admiral, Bright Red and Oat. A festive metallic gold style is also offered. The Jade clutch converts to a shoulder bag thanks to a removable chain-link strap, making it the perfect addition to an evening out. Fine craftsmanship and a graphic floral motif render this a rich statement piece. Rounding out the Ramadan capsule collection are the Barbra clutch and Jet Set leather card case, both featuring the intricate and lovely metallic leather floral motif mentioned above. Two elegant and modestly cut navy kaftans, one with an opulent gold foil print will ensure head-to-toe glamour, while our Cayla and Paloma sandals which complete the total look. A calligraphy artist rounded out the evening, creating bespoke designs on signature Michael Kors leather pouches, creating an elegant and elevated accessory and perfect keepsake from the eventful evening. The Ramadan capsule collection will be available in stores starting April, right in time for the Holy month’s festivities. Our MICHAEL Michael Kors’ pre-fall collection will hit stores in May. Stay tuned!